…accompanied by much bewailing of the state of the nation, as well as accusations of “plundering” and “lost value”. Usually made by whatever the South African version is of angry white republicans from Iowa. 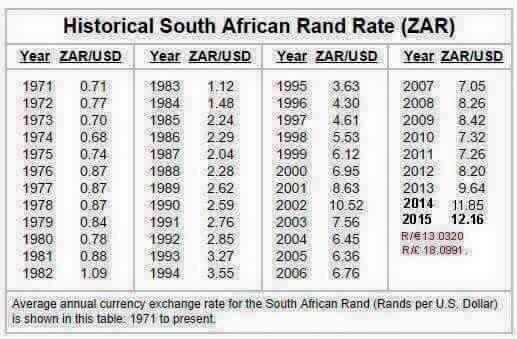 Between 1973 and 1994, the Rand:Dollar exchange rate went from R0.70 to R3.55, making that an 80% depreciation in value during those 21 years of Apartheid rule. Between 1994 and 2015, the Rand:Dollar exchange rate went from R3.55 to R12.16, making that a 70% depreciation in value during the last 21 years of ANC rule. So that’s just the math. And Apartheid ain’t winning. But more importantly, the story is flawed. Let me take you back to a Friday post from two weeks ago (“How Teens Can Become Millionaires“), in which mistaking “nominal” economic numbers for “real” economic numbers can make for some really bad conclusions. Nominal numbers are just numbers. Real numbers tell you what you can buy with them. Here is some other trouble: when it comes to exchange rates, people get far too comfortable with the word “real” – talking as though “real” money means US dollars, while SA rands are just, I dunno, for fun? Anyway, that awkward conflation of terms is unfortunate because historical exchange rates are not “real” – they are nominal. That is: the difference between an exchange rate of R0.71 to $1 in 1971 and today’s exchange rate of R12.16 to $1 is meaningless unless there is real world context. A loaf of bread in the 1970s set you back about R0.50. A loaf of bread today will set you back about R11. Conclusion: in terms of purchasing power, things are basically the same. You could buy a loaf of South African bread for $1 in 1971, and get some change – and you can still buy a loaf of South African bread for $1 in 2015, and get some change (albeit slightly less change). And I need to emphasise that the nominal story applies to incomes as well. So it’s not like a job that earned R50 a month in 1971 would still earn R50 a month in 2015 – although it might still earn the purchasing power equivalent of what R50 in 1971 could buy you. Money’s value is relative, not absolute. Of course, this does mean that you have an issue is if you decided to keep all your money in a mattress. Because in that case, yes, you’ve lost most of the value of the rands in your mattress since 1971. But my only response to that would be: why on earth would you take a bet on the relative value of money being the same as the absolute value of money? That is both curious and absurd. The gradual depreciation of the Rand over time is not a function of misrule – it is mostly a function of South Africa being an emerging market economy (with higher growth rates) and the United States being a developed economy (with lower growth rates). Consider what happens when an economy grows: as it does so, you get more income for people, which makes for more spending, which makes for higher prices. So the rising tide of GDP is experienced across the board (although it can get a bit lumpy in the short term, with some sectors/areas experiencing the growth more strongly than others). So let’s assume that an emerging market would grow at about 9% over time, while a developed market would grow at about 2%. I’ve indexed them to illustrate this difference, assuming that the US economy started at 100 in 1970, and the SA economy started at 71 in 1970, in order to get an implied exchange rate of R0.71 to $1 (seeing as purchasing power parity is meant to exist between countries – or, at least, that’s the theory). Admittedly, there are some rather broad assumptions going on in there. Probably far too broad for a real economist to not scoff at. However, still less broad than that nominal exchange rate table that keeps appearing on twitter. Do not keep money in a mattress, unless you live in a zero growth (or better yet, a negative growth) economy. Exchange rates are not a statement of faith in a country’s government – they are economic data points that are sometimes a bit influenced by governments, but mostly, they are a function of fundamental economic differences between two countries. Whenever someone presents you with a table of historical data, the words “nominal” and “real” are not just words. They mean things. The Big Mac Index. And the adjusted one. Excellent post. May be a bit too in depth but does real rates today tell us anything about relative exchange rate valuations? Does PPP adjustments give us the “real” rate from the nominal rate? To answer your question – I’m not sure that there is such a thing as a “real” exchange rate. As I see it, under all modern monetary systems, money is always nominal (because we only have fiat money). And when you talk about exchange rates, you’re talking about the cross-rates between different nominal systems of recording transactions. So to talk about ‘real’ rates of exchange is a bit of a misnomer – the only time I’ve heard it is in reference to countries that are in hyperinflation (where the rate of internal inflation is so high that foreign currencies essentially become “real” assets relative to the domestic currency). That said, it sounds like you might be asking if the difference between spot exchange rates and implied PPP exchange rates can tell us whether a particular currency is over- or under-valued? As I understand it, that’s dangerous territory. Daily exchange rates are a function of multiple types of demand (trade, long term investment, speculation, regulatory actions) and multiple types of supply (also trade, long term investment, speculation, regulatory actions). We can talk about long-term and global trends – but for the short-term stuff, yikes. I wouldn’t take too many bets with my money, and generally speaking, I’m all about forward cover. But perhaps that’s just me! I always thought the depreciation of the currency could largely be reconciled to the interest rate/inflationary differential between two currencies. Thanks for the comment! So I agree with you – but I think that I’m saying that here (if not in such an explicit way). Over the long term, exchange rates will tend towards purchasing power parity (where goods in one country will cost about the same in relative terms compared to goods in another country, with some differences for transports costs, tariffs, etc). So the implied long-term exchange rate is a function of purchasing power – and that purchasing power will be described in “nominal” terms (because fiat money is always nominal – its value is not fixed against some kind of underlying asset). And when you have countries with higher growth rates, you get larger changes in the value of their currencies relative to their purchasing power – which implies a long term depreciation until their growth rates slow to the same rate as the corresponding lower-growth countries. And that purchasing power shift is an inflationary differential. In the shorter term, however, you tend to find more fluctuation in the exchange rate than this slow long-term purchasing power rebalancing would suggest. And one theory for that is “interest rate parity” – where traders use the differences in interest rates to do carry-trades against the future exchange rate (which is forecast based on inflation). That said, recently, interest-rate-parity has not been such a good model for the general movement in exchange rates. Right now, it seems that the market risk-on-risk-off trade forces the movement in global exchange rates with almost no regard for domestic interest rates (for example: the Turkish lira, the SA rand, the South-East Asian currencies, the Brazilian real – they’ve all tanked in concert, in spite of interest rate hikes). I’m not sure if the above helps? Agree with Jayson that over the long term currencies should depreciate relative to one another by the inflation rate differential (theory). But because currencies trade in free markets and tend to be governed by global forces (as much as 75% of rand trading can take place off shore in a day), the short to medium term differences don’t tend to approximate the theory (practice). Another way to look at it is that both the USD and ZAR have been inflated into oblivion by massive monetary expansion. The USD has the advantage of being a reserve currency, which means significantly more demand, so they also get to suffer less by sharing their inflation with other nations. This transfers purchasing power from those who gets to spend the newly created money last, (most unfairly, savers with high exposure to cash), to those who gets to spend it first (government and borrowers). I would not really call this type of behaviour “misrule”, but words like “hidden tax”, “swindle” and “theft” does come to mind. Thanks for your comment. From my side, I’m not denying monetary expansion – but I’m not as convinced that it’s such a problem in the long term. As in: I agree that if you kept your money in a mattress (ie. if your asset allocation choice is straight-up cash, rather than stocks/bonds/commodities/property/etc), then you definitely lost out. But I’m just not sure that you can then retrospectively declare that “theft” and “swindling”. When Nixon took the world off the gold standard in 1971, money stopped having value in itself. You could still go and buy gold with it – but that would now be an investment decision that anyone with cash would have to make. Meaning that anyone that decided to maintain their savings in cash, without transferring it into inflation-hedged investments, basically made a bet on zero inflation. And that was a bad bet? In the short term, mass monetary expansion can be a form of theft. I’ve written about this before in some of my posts on hyperinflation. But the reason that it’s so bad is the scale of the expansion relative to the time frame: it happens so quickly that people lose purchasing power faster than they can re-negotiate their incomes or re-allocate their investments. But when you have long term monetary expansion that is basically a by-product of economic growth, then you get growth in nominal incomes and investment returns that matches the rate of inflation. In which case, purchasing power is mostly unaffected. And if your purchasing power is unaffected, then what have you lost, really? I always understood this movement to be mainly due to the fact Nixon moved away from the gold standard in the early 1970s. Surely having less demand for our biggest export at the time dented our economy and in turn our exchange rate? Accepting this as gospel, what does that say about the ZAR/USD between now an Jan with the two possibilities for Janet’s Dec decisions? Does your theory work for prediction as well as hindsight? Never accept anything as gospel! But to try and give an answer here – I guess an important related question is: has the rate hike already been priced in? Which, you know, who knows? My general suspicion is that the Rand will continue to weaken into the New Year – but certainly don’t quote me on that. I’m not an analyst!